It is clear, the Pennsylvania Supreme Court and its County Courts have obstructed the democratic balance of power, overstepped their jurisdiction and authority with rules that are no longer “general” and do in fact, encroach on the constitutional rights of the citizens, inflicting harm on thousands of citizens in violating civil right to due process. The procedural rules they have instituted are neither “general” nor constitutional. Mechanisms such as interlocutory orders delay appeals for years, and discretionary rules allowing judges to obstruct jury trials, have gone unchecked for constitutionality for decades. The public and the legislature have a right and duty to take part in the rule-making of the Pennsylvania Courts. It has been operating in secrecy for over 40 years. In fact, in 1978, Governor Milton Shapp enacted 42 Title § 1703 in response to what he determined was the overstepping of power by the Pennsylvania Supreme Court as intended by the 1968 state constitutional amendment of Article V Section 10(c). The Pennsylvania Supreme Court responded to Governor Shapp in a letter (482 Pa. 522 (1978); 394 A2d. 444) by declaring his demand that they comply with the Open Meeting Law, as unconstitutional. The time has come to abrogate their decision implemented without the consent of the governed and outside of a formal judicial proceeding, as history has shown this was a grave error in judgment. The Judicial Branch must comply with the Right to Know Law aka Freedom of Information Act- (FOIA) and Sunshine Act. It can only be concluded that the epidemic of corruption originating in ours courts, stem from the lack of a checks and balance system that was removed by that letter to Governor Shapp in 1978. A democracy can only survive with an open and transparent government ruled by “the consent of the governed,” as so termed in the Declaration of Independence. It is time for this secret society to end. Article V must be amended to include that all court rules committees must be open to the public, and all rules promulgated must first be reviewed for their impact on the Public announcements will be required a minimum of 30 days in advance from every procedural rules committee, easily visible in every county of the State of Pennsylvania. In 1978, the act of Title 42 § 1702 Rule Making Procedures, was specifically altered by attorneys, to exempt the Judiciary from outside review to which every other agency in the government is subject, for constitutionality of their rules. Section 205 of the Act was repealed by section 504 of the Commonwealth Attorneys Act (71 P. S. § 732-504) inserting ” except section 205 relating to approval as to legality. ” This is unconscionable. All rules from EVERY department and agency, must be tested for their effect on the rights of the public, by another branch of the government. This is called “checks and balances,” and is implied in the U.S. Constitution. The constitutionality under the U.S. Constitution, by the Office of the Attorney General must be done retroactively to ensure that the current procedural rules do not continue to violate due process and civil rights citizen of this state, as evidence shows is the current situation of thousands of litigants. The Judicial Branch can no longer declare that civil rights violations by members of the courts, that cause egregious damages to the citizens of Pennsylvania must be accepted and absorbed as losses by the individuals that came to our courts for justice, but were betrayed by those entrusted with control of personal assets and potentially life-altering decisions. Currently, there are no mechanisms to mitigate the harm caused to the citizens, by judicial misconduct. Although the State waives its immunity to law suits in certain instances, the process is limited and beyond the economic reach and knowledge of most people. There is inarguably in Pennsylvania, an epidemic of manifest injustice being inflicted upon the citizens by the antiquated concept of sovereign immunity, which has allowed the absence of adequate oversight to our Judicial Branch of government. The Judicial Conduct Board of the Pennsylvania Supreme Court has failed to address and or remedy valid complaints regarding judicial misconduct. There is no greater example than the Luzerne County Kids for Cash scandal, that was perpetuated for seven years against thousands of children, because the pleas of scores of families were ignored by the Board. While recent courts have declared that absolute official immunity is for the benefit of the public, it has in fact, created a venue for criminal activity by judges who have no fear of prosecution or retribution for crimes they commit under color of law. It is time to hold our courts accountable for their actions. The Pennsylvania Supreme Court in Mayle further held that”.. as early as 1851, this Court recognized that a properly formulated jurisdictional scheme could provide orderly and adequate compensation for “every damage to private property . . . by the state or [municipal] corporation that occasioned it.” Citing O’Connor v. Pittsburgh, 18 Pa. at 190. This request for legislative action has been echoed many times since. E.g., Morris v. Mt. Lebanon Twp. Sch. Dist., 393 Pa. 633, 144 A.2d 737 (1958). The Judicial Branch is the only entity in Pennsylvania government, that is not included specifically in the Risk and Management policies of the Pennsylvania State Department of General Services. Either the State of Pennsylvania most overtly post the licensing of judges in serving as their guarantor in all courts of record in Pennsylvania, in the minimum amount of $500,000 per judge, or in the alternative, judges must be required to purchase a public official bond for their time serving on the bench. A streamlined process must be implemented for the resolution of complaints, and for dispersing of restitution awards, outside of the Judicial Branch. A committee must be organized to oversee this process, whose membership will include a cross-section of the public, and prohibiting members of the bar associations and judiciary from participating. In 1969, the Courts disputed the ban of judges during the formation of a Judicial Qualifications Commission, and therefore that Commission does not exist. This needs to be rectified. Lawyers are becoming judges with no knowledge of the disciplines in which they are making life changing decisions for litigants. This is tantamount to allowing a dentist to perform brain surgery. Institution of a Legislative Committee and removal of the PA Supreme Court, as the ultimate arbiter of the punishment is paramount to ensure the public is not victimized by incompetent judges. Pennsylvania State Constitution in Article V Section 18, mandated that six of the twelve members of the Judicial Conduct Board, are to be citizen members. However, the Board has not been in full compliance with this mandate. Current members representing the citizens are past magistrates, police officers, retired attorneys, and/or large contributors to political campaigns. This clearly creates a conflict of interest and is not representative of the public-at-large, to which the complainants belong. The applicants for serving on the Board will be advertised in every county in the State of Pennsylvania, for at least sixty day prior to an opening on the Board. They will be entered into a lottery, and may not have any immediate relatives affiliated with the courts or who are members of any bar association. The applicants will have to fulfill certain educational and age requirements, and cannot have been convicted of a crime. There must be three men and three women, over the age of 35, are citizens of the United States, 20% of whom must represent ethnic minorities and diverse religions, and have been legal residents of the State of Pennsylvania for a minimum of ten years. The Judicial Conduct Board is supposed to be an “independent agency” separate from the court, however, the court, through the Judicial Disciplinary Council is overstepping its authority and the principles of democracy, as being involved in the judicial disciplinary process. This authority must be transferred to the General Assembly, who already handles the impeachment process. A Committee to include citizens, must be the ultimate decision-makers regarding the removal of a judge, and not their peers in the courts. State Standardized Court Rules and Fees. For decades, the court rules have become increasingly complex with unnecessary local county rules, often in conflict with the Pennsylvania Rules of Civil Procedures. 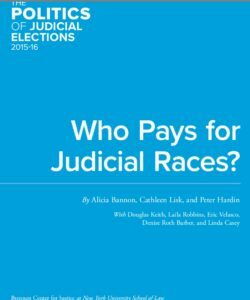 As the numbers of self-represented litigants has increased, it has created a barrier, both economically and educationally, to navigating our courts. It was never intended, and it is unethical, that the justice system have its main goal as a profit-generating commerce system. All local rules will become obsolete, in an effort to create equal protection under the law, which requires simplification of our system. The existence of county rules serves no purpose, other than to create a need for attorneys, which a large segment of our population cannot afford. The common law precedent often conflicts with the civil procedural rules unilaterally inflicted upon the public, as an example, as to what orders may be immediately appealed. While an appealable order is defined by the rules as a “final order” that essentially ends the case, the common law states that the appealability of an order must be considered as to the implications as to what damages may be caused by delaying an appeal, effectively obstructing justice, and due process. These ambiguities cannot be remedied by the current system. It is not the authority of the Pennsylvania Supreme Court to be unilaterally imposing what is essentially a tax to use the courts; this is a function of the legislative branch of government. There will further be one set of fees, under the Pennsylvania State laws, eliminating the unnecessary inflationary practices of the local county courts, that have prohibited citizens from accessing the justice system. Furthermore, They are made to jump over hoops for informa pauperis status, and are often denied by abuse of discretion. This must become a function of legislative committees and not the judges, prothonotary and other employees of the court who profit off of the litigants, especially those that are pro se predominantly due to the current family court system. Attorneys and law firms must be prohibited from making monetary or in-kind contributions to those running for any judicial-related offices including that of magistrate, judge and justices. There is simply no justification for the current system, where attorneys are appearing before judges to whom they have contributed to their election campaigns. This is completely contrary to the ideology of an “independent” judiciary. Child custody and support issues will be removed from under the Judicial Branch, which has shown to have prolonged such litigation, for self-enrichment of the courts. The child support calculations must be delegated to the Department of Health and Human Services – Child Welfare Division – whereby no fees are attached for this mediation. The calculations further must be separated from time spent with each parent, and based upon a standard amount according to the income, with a differentiation of income of the couples, according to their last three years of employment. There will be no allowance of attorneys or court intervention in these matters. The current method of calculating child support by attributing it to the percentage of custody, has in effect, put a price on the heads of our children. This has created massive amounts of domestic conflict and often violence. The hourly fee system of attorneys, and profit quotas imposed on attorneys by law firms, has also contributed to the sad status of the treatment of children as commodities involved in family courts. Adding to this conflict of interest, is the judicial election process allowing campaign contributions, creating vehicles for the wealthier party to purchase favors from the courts. There must be a sizeable change to end these volatile, immoral and unethical conditions.